Adobo again, really? yes and we don't get tired of it. In fact we have different versions of adobo. 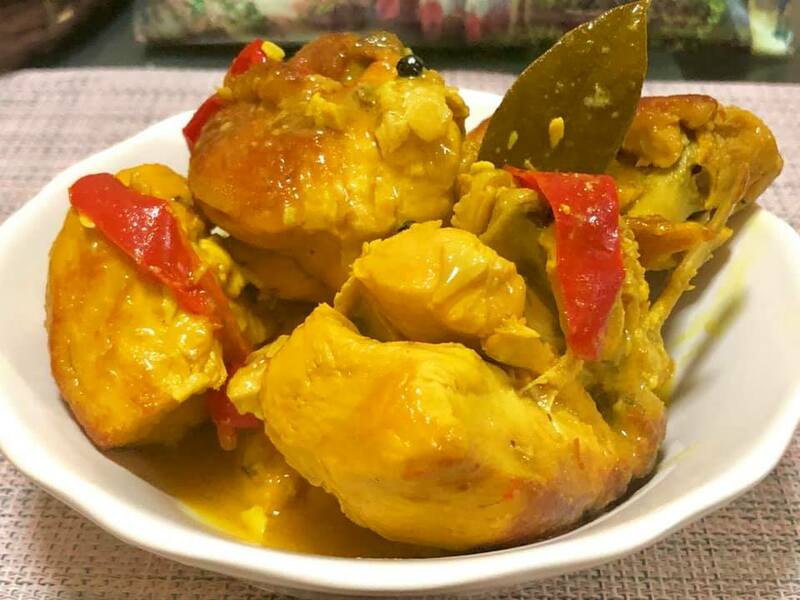 I have the original one, in case you are interested, kindly click the word Adobo and it will bring you to my recipe. I have mastered 3 types of it and today I am going to share the version which uses Luyang Dilaw or Fresh Turmeric. As I go over, reading and tracking the origin, it went back to the original Adobo but later on people from different region developed their own style. 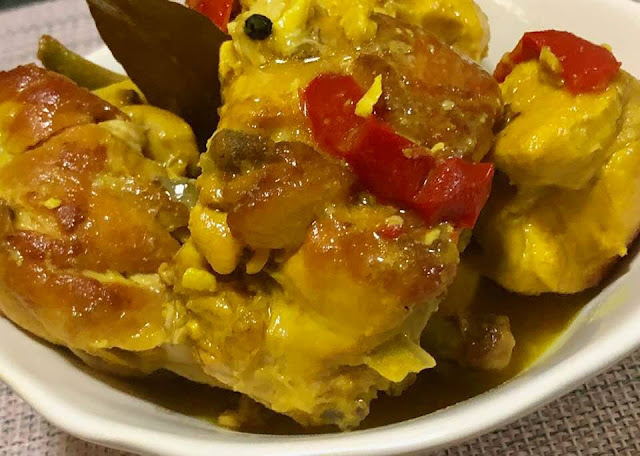 There are 3 provinces in the Philippines which are known for their authentic style of Adobo using Turmeric: Batangas, Laguna and Cavite. Although I first tasted it at home when I was little as my father would cook it every once in a while. I am from the town of Calapan Oriental Mindoro and its just a ferry boat ride from Batangas, approximately 45 minutes. I never like it before until one time my co-worker who is a native of Batangas brought a home-cooked version in the office. When I tasted it again, my memories went back and I remember those times in the farm when I was little. Yes, I became so obsessed that I thought I really have to know and cook Adobo Sa Luyang Dilaw in my kitchen and so I won..
Marinate the chicken with the ff ingredients: 6 cloves garlic, peeled, 3 bay leaves, 1/2 cup apple cider vinegar, 2 tsp peppercorns, 2 tbsp turmeric powder, 1 piece fresh turmeric about 2 inches in size, 1 tsp salt for at least 4 hours. Next, using large sauce pan or wok, put the 3 tbsp coconut oil, fry the chicken by batches. Fry until the color turns white or no trace of pinkness or being raw but not totally cook. Then put the fried chicken pieces together with the marinate sauce into a large saucepan. Cook over medium high heat and bring the mixture to a boil ( note: at this point don't cover ). Once it boils, add the coconut milk and bell pepper. Then turn the fire into a simmering mode. Cover and cook for 50 minutes to one hour. Add the chicken broth when necessary. Once you reach the desired consistency, then its done. Serve and enjoy! Oh look at that..theres coconut milk and turmeric and you know both of these ingredients contain health benefits. But of course, don't eat too much rice. In this case, I cant guard myself on that, my excuse is I am having brown rice anyway. 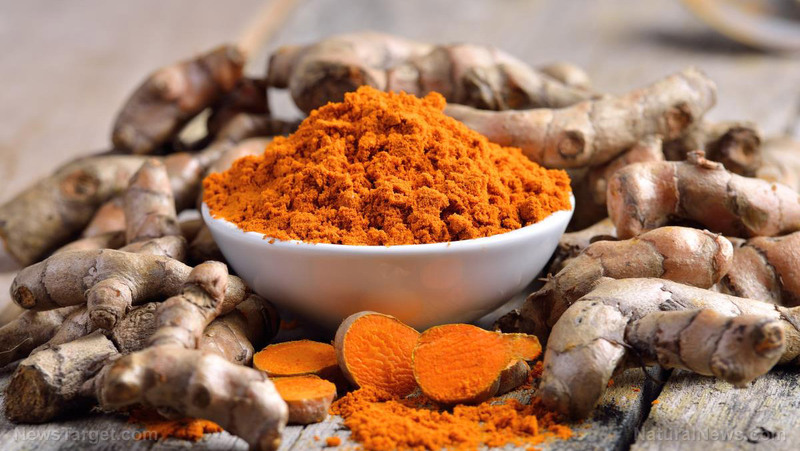 Wondering what turmeric is? Kindly look..Don't you know that you can make a Turmeric Facial? Trust me, it works well: 1/3 tsp turmeric powder, 1 egg white, 1 tbsp oats- Blend all these ingredients. Apply the mixture on your face. Scrub gently in circular motion. Leave on for 15 minutes.Wash off with cold water. It cleanse and tightens the sagging skin and makes us young looking. Hello Cindy,me too..Just found the info maybe 3 years ago and every once in a while I do it and its really good and cheap. 1/3 tsp turmeric powder, 1 egg white, 1 tbsp oats- Blend all these ingredients. Apply the mixture on your face. Scrub gently in circular motion. Leave on for 15 minutes.Wash off with cold water. It cleanse and tightens the sagging skin and makes us young looking. I've never used turmeric or coconut oil with my chicken adobo but will have to give it a try.